Aliases: Aurgelmir, Brimir, Sōjōbō, Bláinn. - Giant, hulking and armored. - Painful, inescapable personal magnetism. - Extraordinary strength and endurance. - Commanding Words: The words of Ymir echo with such sublime assuredness that the things he describes can very well overwrite what another's senses might actually tell them. Practically speaking, he could describe a city in the distance to an onlooker who would see what he had described even though no such city actually existed. This ability is most insidious when someone is told something about themselves, constituting a sort of personal control. - Bombastic Physique: Confidence exhibits itself physically: when most self assured (and he is nearly always somewhere near this state) he is practically indestructible and substantially more potent in strength and dexterity. By contrast, at moments of great personal weakness (rare though they may be) his body and abilities reflects this state. - Corrupted Bloodline: His blood acts as both a poison and a truth serum. It is capable of controlling whoever it infects but will gradually corrupt and ruin them, leaving a hollow, broken, empty vessel. - Spawn of Pride: Capable of creating children in his own image, imbued with his blood and power. These so called "children of pride" are substantially more monstrous than Ymir himself, but are also substantially more vulnerable to physical damage than he is. As a rule they possess at least one of his greater abilities and many have a substantially diminished version of a second. - After the fall, the first child spawned by the amorous dalliances between Lucifer and Mammon was Ymir. 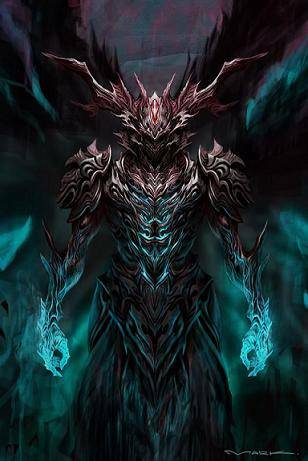 One of the most ancient beings in Inferis and the first demonic soul neither to be a fallen angel or mortal, his birth was a moment of great pride for Mammon. It was this expression of cardinal sin that was imbued on Ymir's being, leading him to be the essence of that sin. The embodiment of entitlement. Of a hollow and greedy pride that drives towards achievement and oblivion in equal measure. And that pride has only grown with the ages. - Thousands of years before the present, the long doted upon son had come to look at himself as fitting for rule alongside the Hell Princes. In a twisted display of respect he spread his corruption across many demons and gathered them in a great army supplemented by his "Children" in order to rebel against Mammon. In striking against his mother, he vainly attempted to show that he could best the Infernal power he most respected. Though a talented tactician and potent demon in his own right, his army was ultimately put down when Lucifer lent aid to Mammon in her struggle against their son. Though he was spared from destruction, it was only at the whim of Mammon. - Has spent millennia chained beneath the Stygian Tundra under the watchful eye of Moloch, only the beginning of a punishment set forth in repayment for his failed rebellion. That he lives at all is a testament to the attachment Mammon still feels for her a demon who is both her son and the fruit of her union with Lucifer. - It has taken thousands of years, but Ymir has slowly learned a way to leak out a portion of his essence. Countless failed attempts at a partial possession of mortals later and he finally found his match in the dying son of a Czech political family. Ever so slowly he has smuggled out more of his power and essence in the hope of ultimate escape. Ymir speaks predominantly in demon Demon (darkred) in bold italics in Etreven's head. He also speaks Ancient Khmer (peru), Greek (lightcoral), Latin (antiquewhite), Old Norse (mediumturquoise), English (khaki), Japanese (darkslateblue), Hindi (skyblue) and Arabic (silver).